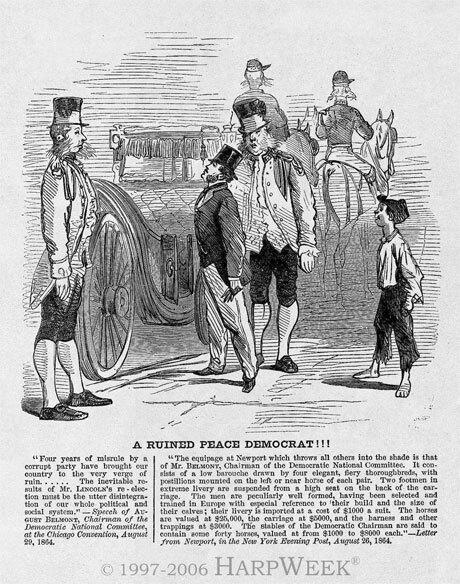 “Four years of misrule by a corrupt party have brought our country to the very verge of ruin …… The inevitable re- sults of Mr. Lincoln's re-elec- tion must be the utter disintegra- tion of our whole political and social system.”—Speech of Au- gust Belmont, Chairman of the Democratic National Committee, at the Chicago Convention, August 29, 1864. “The equipage at Newport which throws all others into the shade is that of Mr. Belmont, Chairman of the Democratic National Committee. It con- sists of a low barouche drawn by four elegant, fiery thoroughbreds, with postillions mounted on the left or near horse of each pair. Two footmen in extreme livery are suspended from a high seat on the back of the car- riage. The men are peculiarly well formed, having been selected and trained in Europe with especial reference to their build and the size of their calves; their livery is imported at a cost of $1000 a suit. The horses are valued at $25,000, the carriage at $5000, and the harness and other trappings at $3000. The stables of the Democratic Chairman are said to contain some forty horses, valued at from $1000 to $8000 each.”—Letter from Newport, in the New York Evening Post, August 26, 1864.